From the rip curls of Lahinch to excitement elevated - rock-face style, Clare will move you! Contrasting Clare: it’s as clear as the sunrise over Lahinch, where purple-pink hues are backlit vivid orange. Contrasts are as much a Part of the Clare psyche as story-telling and ‘not making a fuss’. Contrasts are the busy, meandering streets of Ennis set against the dramatic soulful tranquillity of the wind-swept Burren. The rich and delicious juiciness of a rack of local lamb compared to the sea-salt freshness of the perfect oyster. Yes, Clare is about contrasts, so while many come to our shores to find solace and a connection with a place and time that’s come before – others come to relish in the thrill, buzz and spirit of adventure offered by our world-class high-action sports and activities. If Clare is about celebrating life – our adrenalin-pumping leisure options are about taking it to the limit! Over the years Clare has earned a name as a premium surfing destination – with several beaches offering different surf experiences so you can select according to your skills and experience. 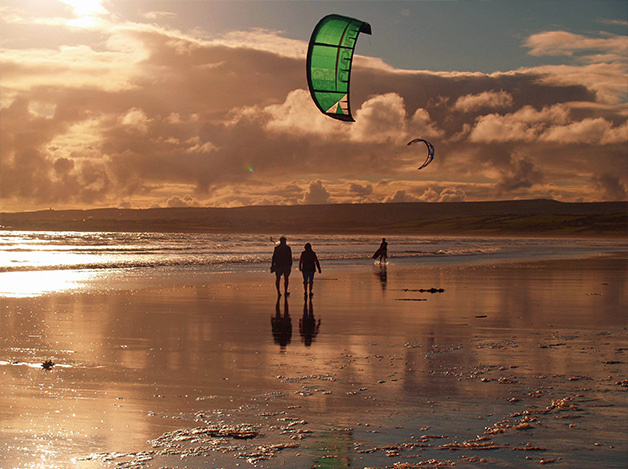 Perhaps the best known surf location is Lahinch, which has become a true ‘surf town’, with plenty of surf schools, surf shops and ‘hang outs’ on offer – and the buzzing vibe to go with it. The main surf break here is along a relatively large beach with rocks along the foreshore. It’s great if you’re a beginner but can also provide some larger, more challenging waves for the more advanced. 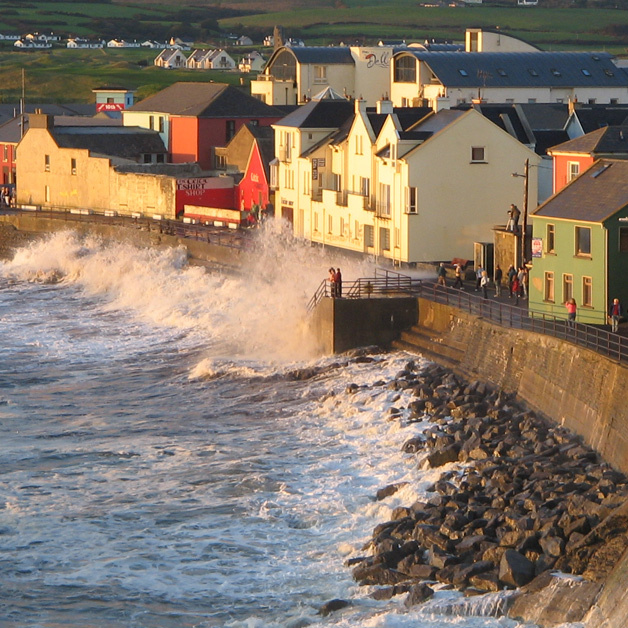 It’s generally agreed that Lahinch works best with an east or north easterly wind and a westerly or south westerly swell, and the best time to surf is at mid to low tide. Other beaches close by are Spanish Point and Doonbeg, which have more swell – and are perhaps for the more experienced or daring. 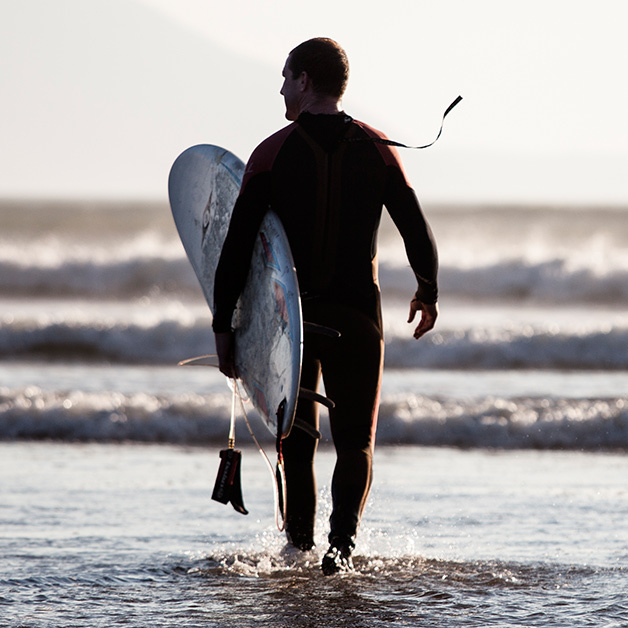 The quality of surf schools in the area is exceptionally good, with instructors who are fully-qualified Irish Surfing Association coaches. Most offer a range of different lessons for all ages and all experience levels – as well as hiring or sale of surfing equipment. Cahermurphy Loop Walk, East Clare – 6.09 miles. Cratloe, Brickhill Bridge – 4.06 miles. Whitestrand to Blue Pool Coastal Loop Walk – 5.08 miles. Slieve Callan Walk, the Hand Cross Roads – 3.68 miles, a moderate walk. Abbey Hill, Near Behagh, The Burren – 3.76 miles, a moderate walk. Black Head, Near Cregg, The Burren – 7.11 miles, a moderate walk. 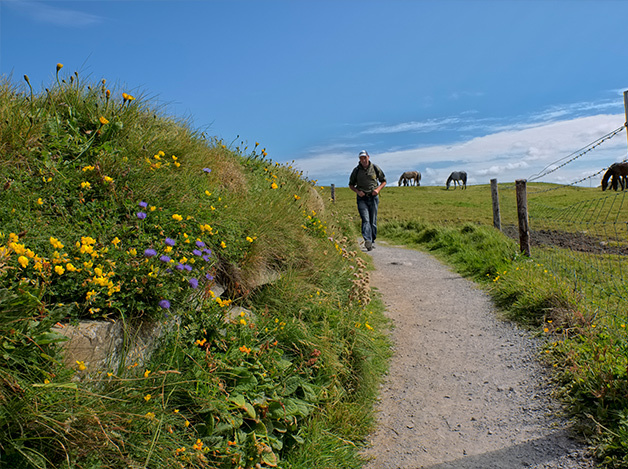 Doolin, Cliffs of Moher – 4.72 miles, a moderate walk. 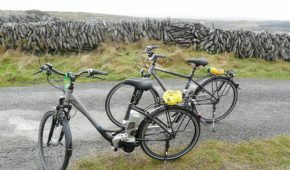 The Mullaghmore Loop Walk – 4 miles. Cliffs of Moher Coastal Walk from Liscannor to Doolin – 12.42 miles. 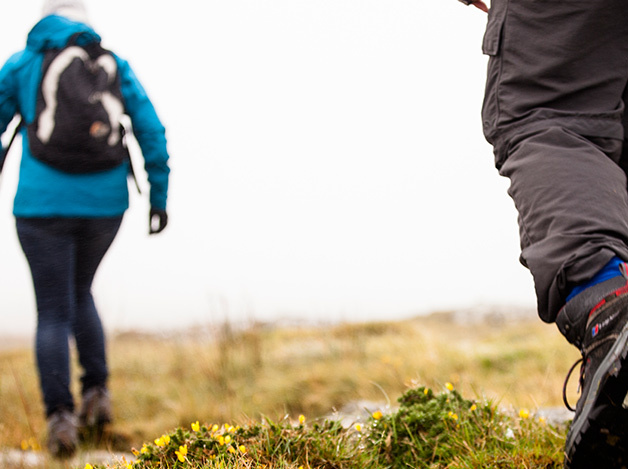 Plus, from the Burren Peaks Weekend of Walking Festival and Loop Head Walking and Heritage Festival to the East Clare Walking Festival – there are lots of special events dedicated to helping you get out there, discovering Clare at its most natural and beautiful. 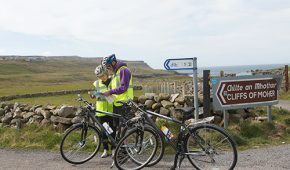 Take an off-road, guided mountain bike tour and follow the road less travelled with the company of an expert guide– with Burren Way Mountain Bike Tours or West Coast Cycle Tours. Connect with the landscape, be in the moment, and feel challenged and inspired by the new and the different. It’s all right there and waiting! 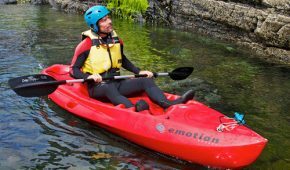 “Magical”, “Exciting”, “Invigorating” and “an absolute blast” – it’s all true of North Clare Sea Kayaking and Nevsail Watersports. Feel more alive than ever before as you paddle accompanied by playful seals – or challenge yourself and your fears as you enter the mouth of an ancient, hidden sea cave. There’s so much more to the Burren than meets the eye. Discover its fascinating beauty and secrets – above and below ground and off-the-beaten track. The Burren Outdoor Education Centre provides exhilarating and adventurous explorations of the area – from underground passages to kayaking in the bay and climbing the craggy lime stones. 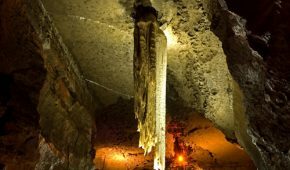 Experience the fascinating world of the Burren’s underground landscape with a caving tour suitable for everyone, from the beginner to the experienced adventurer. Back-West Adventures offers environmentally-sensitive caving expeditions as well as guided hikes across the ragged landscape of the area. 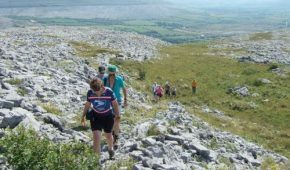 An Adventure Burren rock-climbing experience will introduce you to the thrilling mountains and coastal crags of the Burren – or choose a slightly tamer but just as wonderful hill-walk off-the-beaten track with an experienced guide. 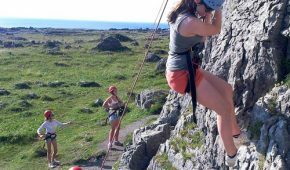 In Ballyvaughan, Bens Rock-Climbing Clinic offers courses and one off climbing and abseiling sessions for all levels – there’s simply no better way to push your boundaries and feel alive! Make your trip your first encounter with the fascinating and hugely rewarding world of sailing, with Nevsail National Training Centre. Learn to sail in safety, comfort and style. 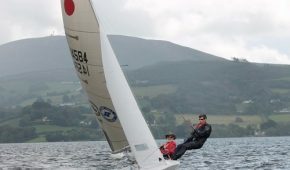 In South Clare’s Killaloe, the Killaloe Sailing Club, offers dinghy sailing on beautiful Lough Derg – for complete beginners through to the experienced sailor looking for the thrill of competition. Can’t decide on your adventure? 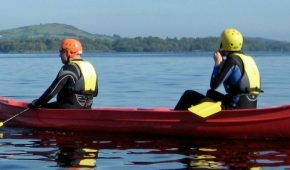 University of Limerick Activity Centre in the East of Clare at Killaloe offers high-quality, high-adventure pursuits – from sailing and power boating to windsurfing, kayaking, canoeing and archery.